Do Alderman Cardenas, O'Conner, and Moore -- as well as Rep. Madigan -- still support schools raided by FBI? Concept charter group raided by FBI, but these charter schools still have clout in Chicago. In an expected turn of events, news reports have confirmed what has long been reported by Substance News and other activists -- Concepts Schools charter operator is being investigated by the Federal Bureau of Investigation for yet undisclosed criminal activities. Chicago Public Schools has five schools from this operator in the Chicago public schools system, the most recent of which was approved by the Board of Education this school year. Chicago Public Schools "Chief Officer for Innovation and Incubation" Jack Elsey (above at microphone) told the Board of Education at its January 22, 2014 meeting that the Board should approve two new Concept Charter Schools "campuses" for Chicago. Elsey, who was brought to Chicago from Michigan into the newly created executive position to incubate and innovate in December 2012, did not face any tough questions from Board members about the controversial charter schools, whose applications simply repeated boilerplate education jargon about promoting STEM. Substance photo by George N. Schmidt. Concept Charter Schools is a major player in the "charter movement" nationally. The charter operator runs 19 charter schools in Ohio, second only to Texas with 44 such schools. There are nearly 140 charter schools, spread across 26 states, associated with Turkish Cleric Fetullah Gulen, an Islamic cleric exiled from Turkey, living in Pennsylvania. The controversial nature of the group has long been public knowledge, with even The New York Times having exposed some of its operations. But for more than a year in Chicago, Concept Schools have received praise from political leaders, whose clout helped the schools expand this school year over growing community objections. One major Substance report in May 2013 outlined the problem and can still be found at the URL: http://www.substancenews.net/articles.php?page=4239�ion=Article. Other stories can be found below. Since 2013, Concept has added four charter "campuses" in Chicago. Two, including the McKinley Park "campus," were forced on Chicago Public Schools by the Illinois Charter Schools Commission, following a rejection by the Chicago Board of Education. The most recent two were approved by the Chicago Board of Education at the Board's January 2014 meeting. Although the Chicago Board of Education rejected the expansion of Concept Charter Schools a year earlier, by January 2014 the Board approved two new "campuses" which would be draining almost 1,000 students eventually from the real public schools in the area. Above, the Board Report that was approved by the Board at its January 22, 2014 meeting approving the "Horizon Science Academy" "campus" of Concept Charter Schools. Board Reports can all be found on the cps.edu website under "Board of Education" (then go to Actions). The Board also makes most of the videos of the Board meetings and Power Points available. Concept's clout and organizing have been visible for some time. In a May 17, 2013 community meeting, Alderman George Cardenas declared that he knew what was best for the area. Cardenas insisted that this charter school was needed for the McKinley Park neighborhood despite evidence that showed no need for any extra schools in the area -- and that the school would be operated on an EPA Toxic site. The school also turned out supporters wearing identical tee shirts for a community meeting. The charter company is supported by numerous Chicago politicians, in addition to 12th Ward Alderman Cardenas. 40th Ward Alderman Pat O'Conner, 49th Ward Alderman Joe Moore and Illinois House Speaker Michael Madigan -- who made a video the school posted on YouTube praising the school -- have all come out publicly in support of the charters founded and run by the controversial Turkish group. Most if not all of the politicians that support this group have received also various contributions or donations from the group. These have included fully paid trips to Turkey "to do research." Following the news on June 10, 2014 that the group has been raided by the FBI, it will be interesting what exactly is the FBI is looking for and how the politicians that have taken money and gifts from this company are associated with the ongoing federal investigation. The news about Concept Schools comes less than three weeks after the news was reported that the Securities and Exchange Commission (SEC) was sanctioning another major clout-heavy charter school operator in Chicago, UNO. The FBI and two other federal agencies conducted raids in Illinois and two other states at charter schools run by Des Plaines-based Concept Schools, FBI officials said Tuesday. Search warrants were executed at 19 Concept schools in connection with an �ongoing white-collar crime matter,� said Vicki Anderson, a special agent in the Cleveland FBI office that�s leading the probe. The U.S. Department of Education and the Federal Communications Commission also were involved in the June 4 raids, but officials said the warrants remain under seal, and they wouldn�t give any details about the investigation. The raids targeted Concept schools in Illinois � where Concept has three schools in Chicago and one in Peoria � as well as in Indiana and Ohio. 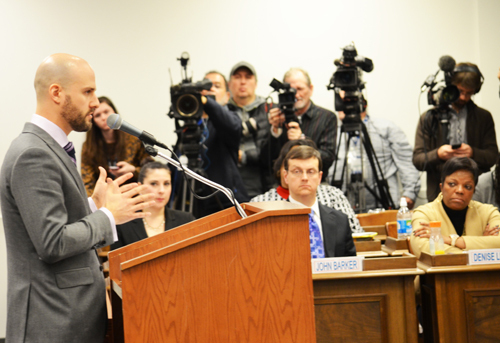 A Concept spokesman said federal education officials had conducted an audit recently. Concept was founded by Turkish immigrants and has ties to Turkish-American groups that have hosted Illinois House Speaker Michael Madigan and other state lawmakers on trips to their homeland in recent years, the Chicago Sun-Times reported in December. In 2012, Madigan visited Concept�s Chicago Math and Science Academy at 7212 N. Clark St., and praised the school in a video posted on YouTube. 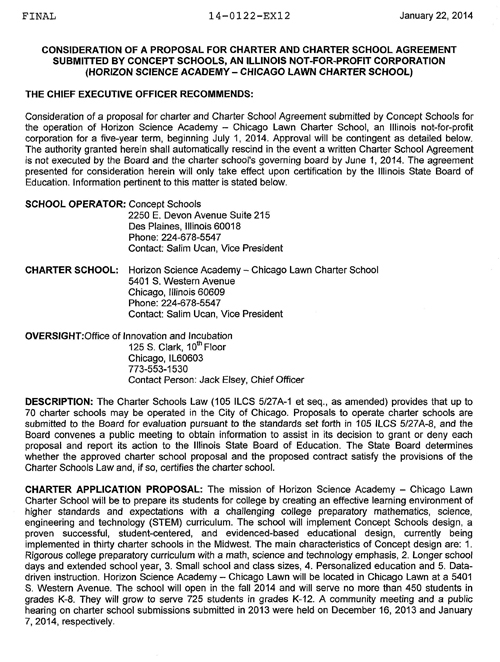 After its efforts last year to open two new taxpayer-funded charter schools in Chicago were rejected by Chicago Public Schools officials, Concept appealed to the Illinois State Charter School Commission, which overrode CPS and allowed Concept to open Horizon Science Academy McKinley Park at 2845 W. Pershing Rd. and Horizon Science Academy Belmont at 5035 W. North Ave.
CPS officials were more receptive to Concept earlier this year, approving what will be the chain�s fourth and fifth schools in Chicago, in Chatham and South Chicago. Below is a report for the Beacon Journal and links to past stories about the charter operator. Federal agents have raided 19 charter schools, including three in Ohio, where an FBI criminal investigation in Cleveland has led to search warrants in Indiana and Illinois over the past week. The 19 schools are managed by Concept Schools, a charter school operator headquartered near Chicago. Concept Schools has been investigated previously by the U.S. Department of Labor for its use of foreign workers. Ohio audits found that public money for the schools had been used improperly for visas. Concept received more visas for immigrant workers than Google in 2009 and many of the school�s employees are of Turkish descent. Most of the nonprofit schools� board members in Northeast Ohio are male and of Turkish descent. The company manages 19 charter schools in Ohio, second only to Texas with 44 such schools. There are nearly 140 charter schools, spread across 26 states, associated with Turkish Cleric Fetullah Gulen, an Islamic cleric exiled from Turkey, living in Pennsylvania. The raid began last week as unmarked vans and agents seized documents. The search warrants have been sealed. �Last Wednesday afternoon we executed some search warrants in conjunction with the (U.S.) Department of Education and the FCC (Federal Communications Commission),� said Vicki Anderson, a special agent with the FBI Cleveland office. Katherine Beckwith, a spokesperson for Concept Schools operations in Indiana, released the following statement in response to the raid last week. Anderson could not speak to the nature of the Indiana raid, or whether the audit also is part of the white-collar criminal investigation. She also could not confirm or deny any connection with previous investigations, which date back to 2011. A request for comment with Murat Efe, superintendent Concept Schools� North Ohio Regional Office, was not immediately returned. Near secret push for McKinley Park site for charter school! Concept Schools was granted two charter schools by the Illinois State Charter Commission. Because they won approval through the Illinois State Charter Commission, these two schools will not be run by CPS. They will comprise a district unto themselves, governed by Concept Schools. Given Concept Schools their own two-school district to manage is especially problematic as Concept Schools has a history of financial irregularity and mismanagement. http://azstarnet.com/news/blogs/senor-reporter/sr-reporter-pima-ida-helped-turkish-run-out-of-state/article_a20e6180-c1de-11df-bc8e-001cc4c03286.html (Please note: this bond was approved). Concept Schools is also part of the larger entity, Concept Schools International, which has ties to for-profit school and to an overseas political organization. It's been six long years in the making.